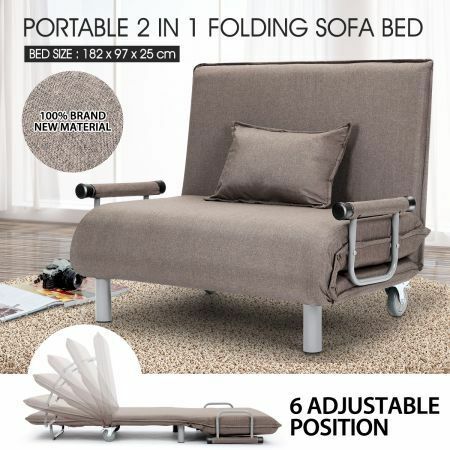 Always have an extra seat or place to rest your head with this Portable Folding Rollaway Bed/Sofa with Mattress–Taupe! Equipped with a comfy mattress set on a durable powder coated metal frame, this 2-in-1 convertible guest bed is as comfortable as it is convenient. This chair easily unfolds to a bed length of 190cm as the high-density foam sponge acts as an extra-thick cushioning to avoid discomfort from the frame below. Two locking wheels ensure the bed stays put. The sleek design of the bed allows it to be easily folded away and stored, while smooth wheels assist with manoeuvrability. Ideal for surprise overnight guests, small bedrooms, dorms and campers this rollaway folding bed is an asset to any home! 182cm x 97cm x25cm approx. 81cn x 97cm x 79cm approx. 124cm x 97.5cm x 21cm approx. Very nice one highly recommended this sofa. 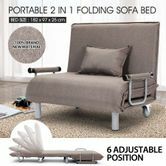 FantasticComfortablePerfect for when need bed in hurry Super fast delivery.